There are 7 study rooms and 2 conference rooms in the library. Both room types may be scheduled up to 1 week in advance by members of the UAS community (no reservations needed during Summer). These rooms may be used by public groups on a space available basis. Call 907-796-6300 to check availability. Interested in bringing your event to the Egan Library? We are pleased to share in this opportunity to enrich our campus and our community. The large open seating area on the first floor of the Egan Library offers an appealing location for public events. The basic configuration consists of ~110 chairs (in rows), a stage, and a podium. The space can accommodate up to 175 in chairs. We are pleased to accommodate activities complementary to our academic support mission. Lectures, scholastic award ceremonies, art exhibits, performances and conferences are examples of mission-compatible events. 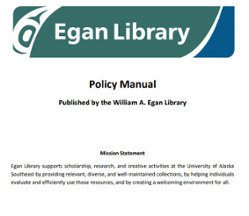 The UAS Egan Library’s primary function is as a research and academic support facility. In order to maintain quiet study areas for students, we limit the number and type of activities taking place in the building during our regular service hours while classes are in session. Between semesters and on Friday and Saturday evenings we may host events of a broader scope, including concerts and Community Day activities. Library hours, semester breaks and schedule changes are posted on our website 5-6 months in advance. Events are not permitted during service hours for the weeks of midterms and finals. Use of the Egan Classroom Wing Display Case is managed by the Egan Library. Any campus unit/affiliated staff can request a reservation. Reservations can be made for 2-4 weeks up to two months in advance. Reservations are accepted on a first come first serve basis. Displays include campus programs/activities, UAS sponsored community events, class offerings, student work, Facilities projects and Lakeside Store merchandise. More (Policy Manual section 2.9 p. 11 Exhibits and Displays Policy). Please visit the UAS Room Scheduling page for information about use of Egan Library 104 or any of the Egan Wing classrooms (including the Egan Lecture Hall and Glacier View Room).